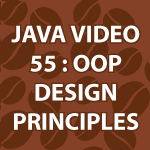 In this part of my Java video tutorial I focus on Java OOP Design Principles. We are still making the game we started in make a Java game, but now I’m creating all of the needed parts with strong use of encapsulation. I walk you through the think process of going from features needed to a finished UML class diagram. I know this is an odd way to talk about OOP design principles, but I wanted to present it in a new fresh way. What’s better than making a game while learning OOP? 1. Draw polygon in the center of the screen with points surrounding the center points. d. Might need upper left hand x & y?